It's one of my favorite times of the month....thrift store upcycle challenge time! I love going to thrift stores and looking for pieces with hidden value. Those pieces that will be just right after a little makeover magic. Lately when I've visited my local thrift store, I have found items that were perfect contenders for this monthly upcycle challenge. The hard part has been narrowing down which one to work on first! After last months Lego Doll House Tray, I didn't think that I would be able to make something I liked quite as much. Then I found the picture frame that was just begging for a little attention. 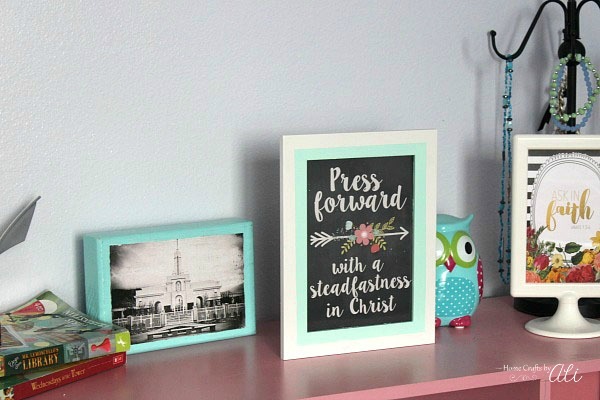 This easy makeover gives a fresh look and with the perfect quote, it makes a lovely little decor piece in my oldest daughters room. 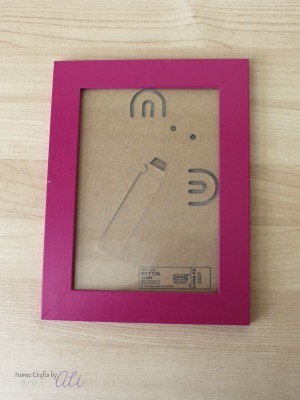 You can easily update a picture frame in the same way! 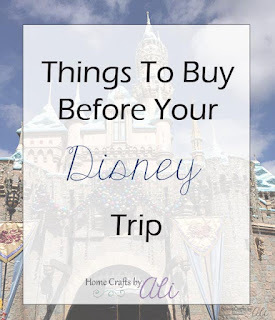 Follow my simple steps for a cute updated decor piece. 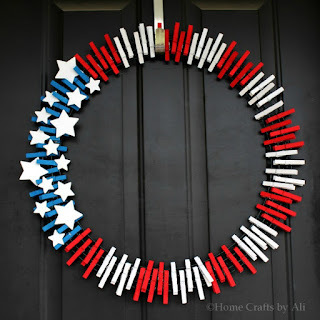 Each month I participate in this upcycle challenge and join with other bloggers to bring you interesting projects that you can do in your own home. 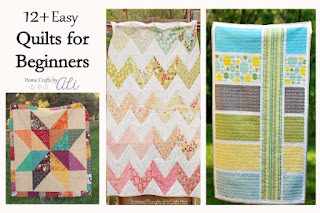 These tutorials can help you get some ideas for thrifty projects of your own! Visit a thrift store and you will see plenty of picture frames. As I was looking through the frames a while ago, I found a plastic IKEA frame that was just right for a 5x7 print. I decided to buy it, even though it was a bright pink. I knew I could make it over. I had been searching for a 5x7 frame because when I bought a book at the thrift store a few months ago, it had a photo print tucked inside it as a bookmark, and I knew my daughter would like it. I guess this month is actually a double makeover! I bought my frame for .75 and the print came in a .25 paperback book. $1.00 isn't too bad of an investment for this project. Step 1: Since the frame was made out of plastic, I lightly sanded all surfaces of the frame to make sure that the spray paint would stick to the frame. The paint has a primer and says that it works with plastic....but I did it just to be safe. It only took 2 minutes, so I wasn't worried about wasting time. Step 2: Wipe with a damp cloth to remove any paint dust. You want a clean surface when painting. Let dry or wipe with a clean dry cloth. Step 3: Place your project on plastic sheeting in a well ventilated area. 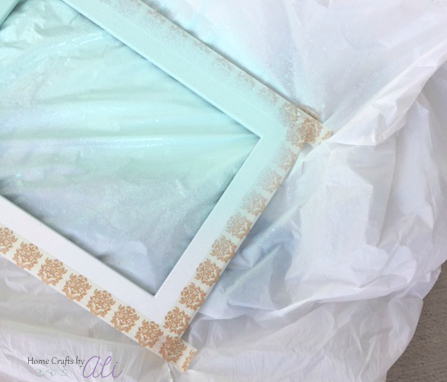 Shake your can of spray paint, hold about 6 inches from your project, and spray the frame evenly with the white paint. I only needed to apply 1 coat of the white spray paint. Check your project to see how it looks and add another coat if needed (wait 5 minutes between applications). Step 4: Let the paint dry completely - 4 hours or more. Step 5: Once the paint is completely dry, tape the outside edge of your frame with painters tape or washi tape. I taped halfway in the frame (half an inch) along each of the four sides. 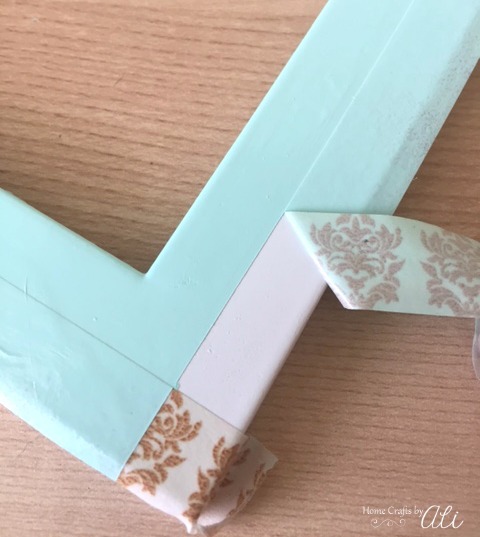 Make sure the washi tape along the edge that you will be painting is tight against the frame. You don't want leakage of the second color paint. NOTE: If you don't let the first color of paint dry all the way, when you peel back the tape, little bits of paint will come with it. Learn from my mistake so you don't get frustrated halfway through your project. Step 6: Spray a coat of your second color paint...remembering to be in a well ventilated space. Let the paint dry for 10 minutes. Step 7: Carefully peel the tape from your frame. It works best if you peel the tape at an angle away from the painted edge. Your paint will still be slightly wet. You remove the tape while the paint is wet so you have a clean edge. If you let the paint dry all the way it causes little chips in the paint. 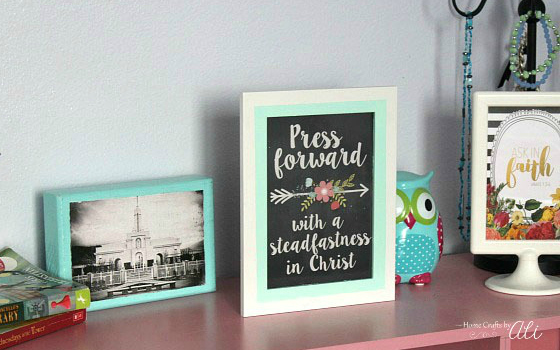 Let the paint dry for 24 hours, then add a photo, your favorite quote, or a pretty printable to the frame and display it in your home. My daughter was excited to add this to the decor in her room. It definitely matches some of her other pieces of teal/turquoise items! There you go! 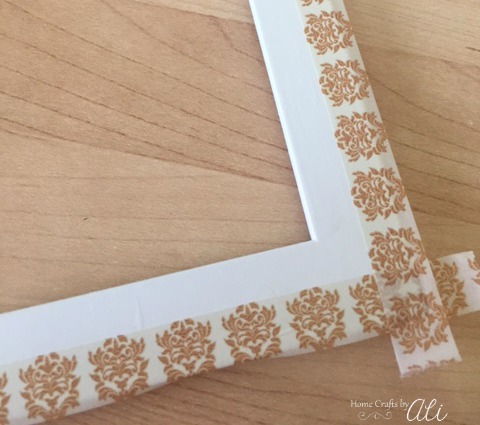 An easy makeover to a thrifty picture frame. 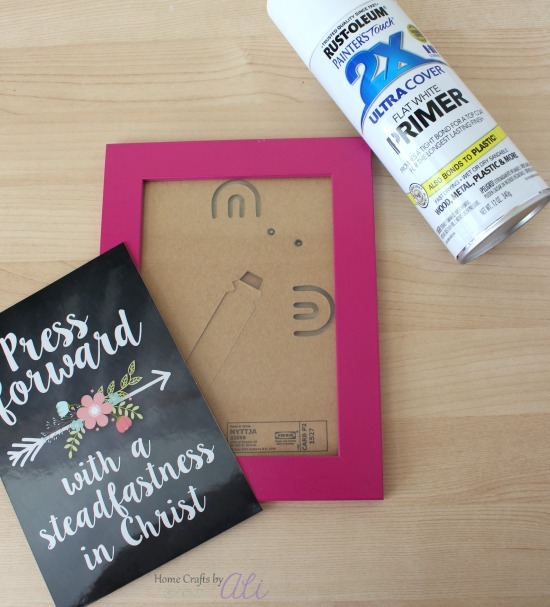 Spray paint makes projects like this so simple! I hope this gives you an idea of how you can update some of your frames. I love the color combination! Looks great with the other accessories. Thanks Amanda. My daughter really likes that color. Thanks for your nice comment Maureen! It was fun to paint it in a different way. Love how you added two colors to the frame. It looks very pretty! Visiting from Thrift Store Challenge. Thanks Victoria. I was happy with how it turned out! Very cute update for a very vibrant frame. That picture doesn't look at all like it came out of a book! I lucked out that someone was using the picture as a bookmark and forgot it. My daughter loves it! I love how you took the bright frame and made it over so it is a customized frame. The saying is so inspirational and a good reminder to look at each day. That bright frame definitely needed some toning down. My daughter had it on her bedside table so she can see the quote every morning. Very Pretty ! 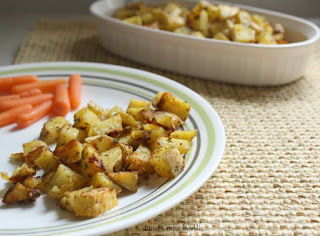 Great way to make what you've got work for what you need! Thanks Jeannee! I like updating items that I find. You used such a pretty color combo. It turned out great and look nice with the other decor. I like the print saying too. We love the quote too, a great reminder! It's such a nice color to work with. It goes well with so many different colors. 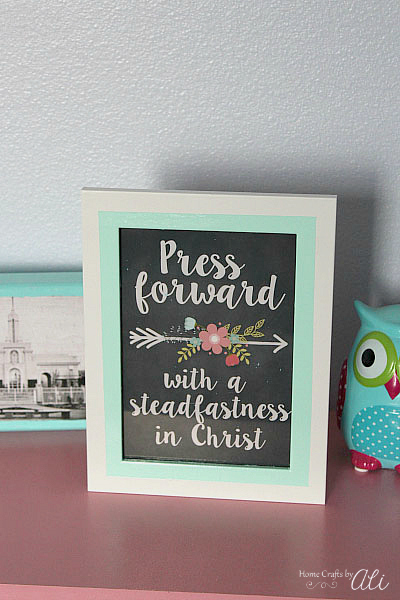 So much better painted white & teal, it really makes the quote pop. Great makeover! It does look so much better! I almost passed by the frame because of it's bright color, but knew that I wanted a simple flat frame. I'm glad it worked out so well. Very cute idea! I love the painted version! I always see so many frames at the thrift store. There are a bunch of frames all the time. I've got a few more ideas for different ways to use them in the future too.